The last time I drove my bike fast was in June. No, that's not true. I drove it fast today. Too fast, perhaps. But that leads me to another question, how fast is too fast? I'm not talking about the speed limits or the consequences of speeding. I find that my sense of speed is completely off depending on what I'm driving - I've hit 65 on a bicycle downhill, on a 75cc two wheeler, on a 350cc cruiser and of course, in various cars. The sensation is very different, but in reality the speed is the same. So, in a rather objective sense, can I tell my brain what my driving speeds really mean? I've always been wary of heights - though not exactly when I've been climbing. I've jumped off enough tall things to have a sense of how it feels. Maybe that's the way I can explain this. 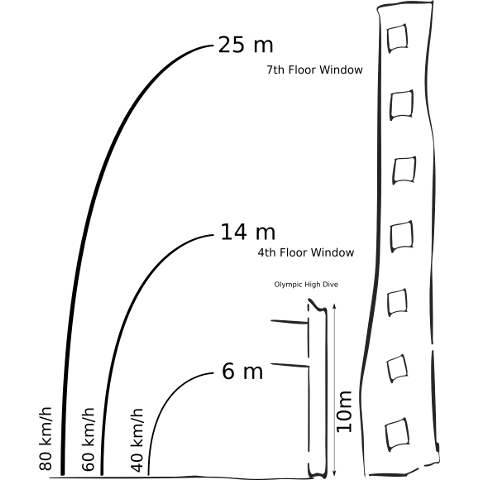 Let's take 3 different speeds and work out how they feel - in "jumping out of the window" terms. The calculations are rather trivial. Now, the numbers clearly indicate the height goes up to the square of the speed you're driving in, rather than than linearly (duh, kinetic energy is proportional to the square of velocity). But what does scare me is what I've added for perspective is an olympic high dive, which sort of looks like this. Not to mention, you aren't going to be hitting a nice deep pool of water. And I still drive fast.